FeastHome – Kitchen is a key space in the home that should not be dull whether small or big. It could be your children’s favorite spot to grasp a storybook, or maybe personal study area or a relaxing place. Who wants to strain their eyes when reading becausethelight is dull or is not working well. Do you want to relax in a dark room? Your mind is not going to be relaxed. Above all else, the main purpose of the room cooking. You need to be verycareful as you go on with your daily chores. From cleaningto meal preparation. If your walls are dark, thecabinets are dull, the floor too ten there is a big problem. Therefore, all the above said and considered, one needs to look for a way to make the room bright and comfortable to work at. This helps avoid such simple accidents in the home. Good news is here; you can now apply any of the outlined method and have things in place. Seats are a feature that can make someone get too comfortable and remain attracted to a room or not. Common ones are either a bar stool or chairs, in the kitchen chairs are preferred. They could be made of metal, fabric or wood. The material chosen will be determined by the purpose for the seat. You need to put in mind the color scheme and contrast them. Check on your wall color, working area color, floor color and contrast with the seats you will be selecting. If you want more light, paint wall with a very bright color, white preferably and bring in white chairs too. 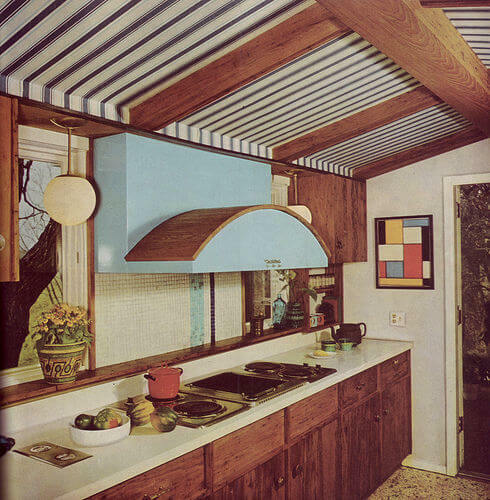 The below kitchen in picture will have color and always remain bright. 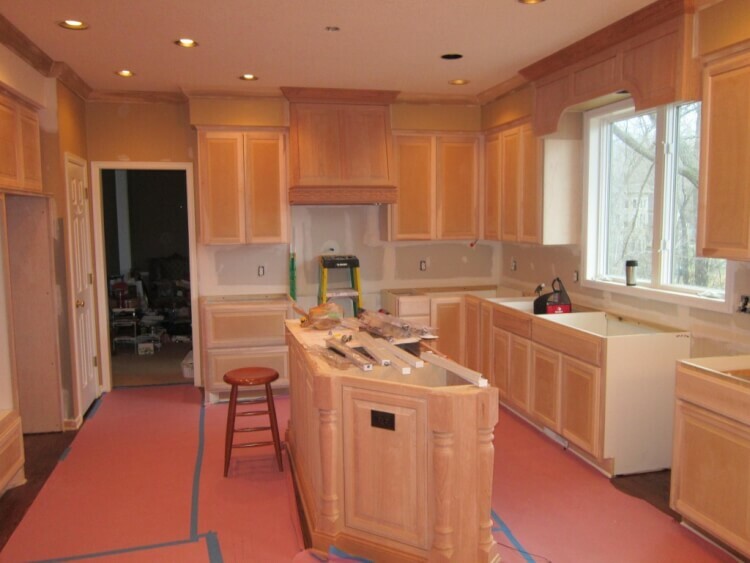 Bring in color starting with the work surface. If this tends to be too dark and dull you can consider changing to a different color. Choose colors you like, and as per the purpose you are interested in them, do not pick what is trending but what satisfies you. We are looking at achieving maximum brightness from color here, so opt for bright colors. Choose what cheers you. Gray, for example, may appear very dull and not pleasing but when you get the rightgrayit will attract you. The worktop being a high place, it reflects most of the light in the room. Therefore, you can pick white to work best for you. 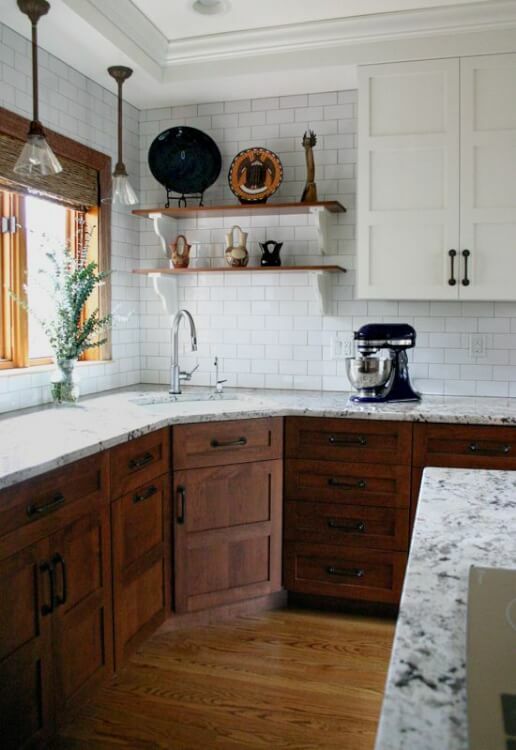 If you choose to change from the dull material that was before, you can use quartz or marble. These can be used on the walls too but contrasted with the cabinets color. You can play around with the structure of you kitchen and the budget you have for bringing in the extra material. You do not need to bring a décor to decide for you. Take in consideration the floor space and think of the different sizes of islands you can place at the center. You should be able to move freely around it. Can also consider something portable that can be removed when you are not using it. 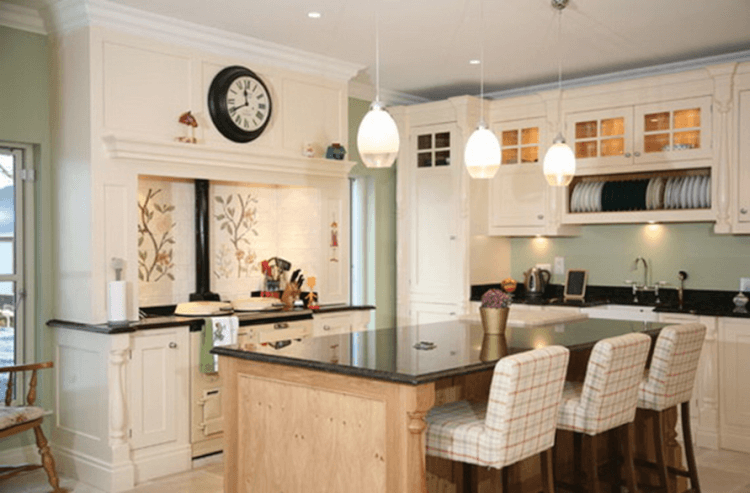 It is also important that your island does not block the entry or exit to your kitchen, so consider that when making your choices.The island will remain the focal point of the room. On top of the light, that you have you can add or replace light fixtures, if you use the blinds open them to allow more light that is natural. Over the work surface, can install lights over. You can see easily when cutting or chopping food with a bright and direct light. This brightens up the kitchen space. Light in the kitchen lets you see what you are doing and brightens up the room. You may even find yourself inspired to tidy up more often. When you have set the kitchens decoration in place and the lighting is complementing it well. You have gotten the intended purpose to cheering up the family. The appropriate furniture, the warm floor, the beautiful decors and the properly set up and installed lighting equipment are all that you need. So what is remaining? You are supposed to show your great cooking skills. Can choose to decorate the meals too. The rest are waiting to enjoy the great taste and smells from you. Do not forget it is Christmas season. The method you choose to brighten up the kitchencan also be decorated. However, you must consider colors that are matching. Have a bright and comfortable kitchen.